October 11th (Wed) 15:30-17:30 @Seminar Room, Wildlife Research Centre, Kyoto Univ. Kibale National Park in Uganda protects the highest primate biomass on earth, and is one of the world's longest running biological and ecological field research stations. Our long-term datasets - some over fifty years long - on plant and animal populations in Kibale provide a unique and valuable perspective on the patterns and processes within protected areas. 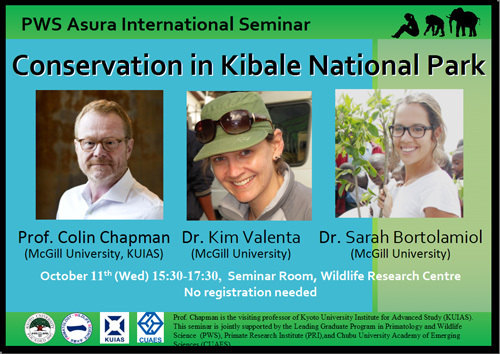 We will discuss the history of the protection of Kibale, its research programs, and researcher efforts to implement applied conservation strategies, past, present and future. The earth's climate has warmed significantly as the result of human actions. Projections vary considerably; however, it is estimated that 75% of all tropical forests present in 2000 will experience temperatures that are higher than that presently supporting closed canopy forests by 2100. Even today, our long-term research site in Africa (Kibale National Park, Uganda) has experienced a temperature rise of 4Ąë C in the last 50 years and a 300 mm increase in annual rainfall. Such changes in climate along with deforestation has isolated many endangered species to areas that may become unsuitable with global warming. Here we provide data from Kibale that reaches back up to 50 years ago to illustrate changes that the primate community has faced. We quantify changes in the abundance and nutritional quality of primate foods, in plant phenological patterns, the species composition of the forest, and the diseases that primates acquire that all may be influenced by climate change and, of course, other interacting factors. Yet despite, such changes, the primate community appears to be remarkably resilient. We discuss the nature of the complex responses to climate change and the value of long-term data in making appropriate conservation and management plans. One of the main problems conservationists face is human-wildlife conflict. It is very difficult to convince people of the need to conserve species that they perceive as pests. Throughout East Africa, one of the major players in human-wildlife conflict are elephants, who raid farms, and can destroy a family's livelihood in a matter of minutes. I will discuss the many initiatives implemented in Kibale National Park, and throughout East Africa, to mitigate human-elephant conflict, as well as discuss a new conservation program that our team is currently in the midst of developing. The integration of local communities within protected areas management is a widely accepted approach to improve the effectiveness of conservation efforts. Despite this acceptance, plans that are put into action are often too broad to match places, uses, and traditions of local communities. In the northern part of Kibale National Park (Uganda), we investigated local spiritual believes, activities forbidden by the park for wildlife conservation, animal protein consumption, bee hive fences and chimpanzee awarness program effectiveness. The combination of scientific and traditional knowledge can enhance wildlife conservation. Such analysis helps drawing park's management and contribute to the understanding of human-wildlife relationships in the context of African tropical forests being surrounded by high densities of human population. Prof. Collin Chapman is the visiting professor Kyoto University Institute for Advanced Study (KUIAS), This seminar is jointly supported by the Leading Graduate Program in Primatology and Wildlife Science, Kyoto University (PWS), Primate Research Institute (PRI), and Chubu University Academy of Emerging Sciences (CUAES).